Frustrated fishermen keep asking, ” Where’s the water?” It’s a legitimate question. 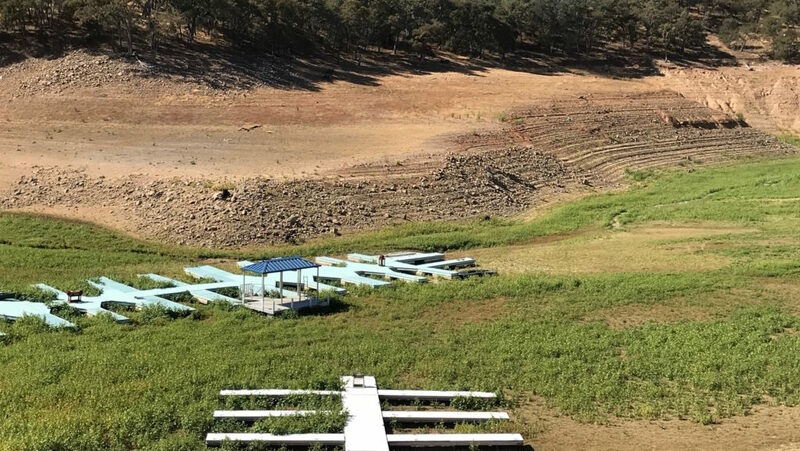 Despite a lot of rain last winter, central California is still suffering through low water levels. This is my dock on a large lake in Central California. The closest water is almost 3/4 mile from where this picture was taken. The “full” level is the light brown line just below the trees. 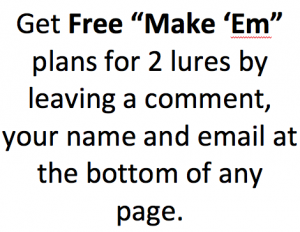 Your boat is your most expensive piece of fishing equipment. 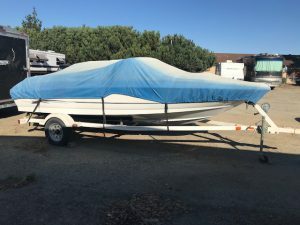 At the end of every fishing season, winterizing boats is important. Proper winterization makes spring launching easier and saves your boat from damage while sitting. Your boat should be thoroughly cleaned, inside and out, before being stored for the winter. This is particularly important if it sat in the water all summer. In fresh water, algae can grow on the hull. Floating dirt gets caught in the algae. If not cleaned, the hull will eventually stain. Salt water can eat away metal fixtures and damage unprotected fiberglass and wood. The boat has is covered with beer and food. There are mud and sand deposits everywhere. Often water saturates floor boards or carpet. Food and beer can stain the floor and upholstery. Moisture can cause mildew. I love stream fishing in the spring. Its too late fish spoons as water levels drops. Its too early to have a lot of success with dry flies because of debris on the water. But, choosing the right bait is pretty easy this time of year. Almost anything will work. There’s water in every stream. The fun and challenge of stream fishing is reading the water and knowing where to find the fish. We’ve waited all winter for the chance to get into that stream or stand along the bank of that river. Its time, but fast water from spring runoff can make things challenging and dangerous. We should think about safety when we think of the fun of fishing in spring runoff. Ultimately, we want to be around to fish the rest of the year. Sure, you may have been fishing all winter through the ice or in the ocean. Or you may live in a wonderful place like California where there is always open water. But its spring. As surely as that means the crack of a ball on a bat, it means fishing season. Its time to get ready. I’m Gonna Keep On Fishin’! If you are ice fishing, you need a hole in the ice. Most people use power ice augers. What are the advantages to a power auger? Are there any disadvantages? Power Ice Augers – Effective? Of course, power augers are effective. They cut through the ice in seconds. But there are things to keep in mind. They are heavy. A snow machine, hand sled or several trips with equipment is needed. They are noisy. But, only while running. They are finicky. Test start your auger before you leave home. They can pollute. Make sure the gas cap is tight. Use the right oil mixture. They are dangerous. Wrists can snap. Clothing can get caught. Feet can get augered. The speed and ease of a power ice auger more than makes up for these issues. 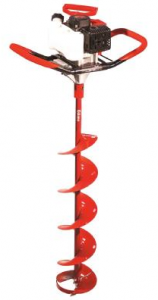 There are a number of models of power augers ranging in price from $250 to over $1200. Price is determined by cubic inch of the engine. This determines the ease of drilling. The size of the auger is also a factor in price. Blades run from 6″ in diameter to 10″. The larger the blade the bigger the hole. Larger blades are more difficult to control. An extension can be purchased for power ice augers. Fisheries have a catch and release policy to maintain fish stocks. Catch and release helps the natural fish population continue to breed. Healthy fish populations are important for lots of reasons. They provide fun for fisherman. They are part of the local eco system. They are a food for other animals. Fisherman release fish to maintain the local population.